Growing up in Germany has given me so many memories and traditions surrounding Christmas. As it is, I can now never seem to find Christmas presents I’m really excited about; whereas while there, I always managed to cover everyone on my list with one trip to the Christkindlmarkt (not to mention the freedom of sipping Glühwein and munching Mandeln ). It still surprises me that this face of terror and fear is not more widely known–that, or it’s given sway to other things that are “nice” up front but hold the same meaning. Elf on a Shelf, that “better watch out, better not cry,’ Christmas song. It’s funny to me that when it comes to the nice faces, we always seem to not only have a choice, but if we choose poorly, we get what’s coming to us. 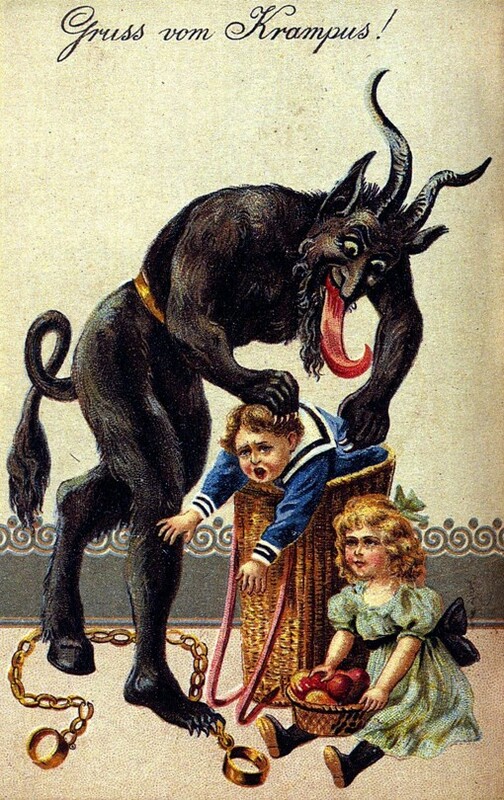 But when it’s a face like Krampus–even if we’re talking children who “chose” to be naughty, who were provided many times in their life to accept the true meaning and spirit of Christmas but who still didn’t “accept Christmas into their hearts”, it’s considered horrific. And–to perhaps the slightly more educated, it’s called what it is: fear mongering. Fear of a scale of naughty/niceness that you cannot control. I mean, is there really any way of knowing for sure? What is the cutoff of being considered naughty? If I’m one step above that am I considered nice? 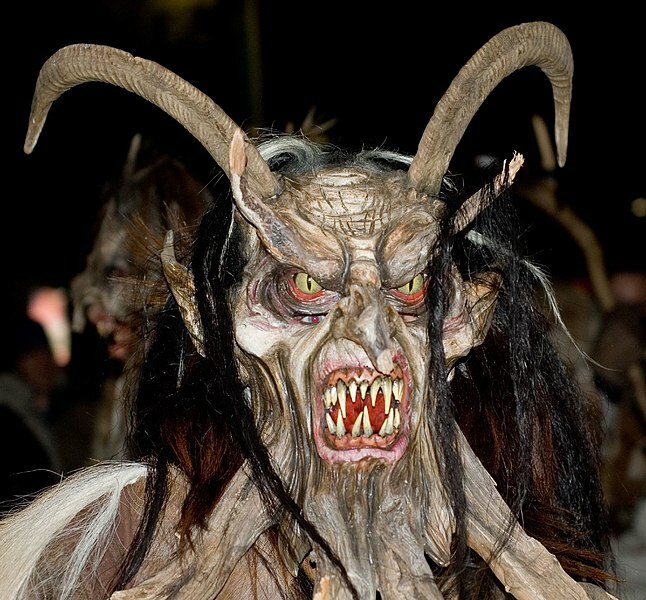 Am I able to avoid Krampus when he comes around? And that’s what I love so much about Krampus. I mean, at least in Bavaria they give him the face that he deserves. They don’t dress it up to look like something it’s not–a Monster. Here in the States no matter how you justify it, that same fear is present for children around the holidays, it’s just packaged to not look like the (a) monster that truly elicits fear rather than love. Will I get what I want? Or will I get nothing but coal (still useful if you think about it, but it doesn’t compare to getting everything you want free of any service of yours)? The single most terrifying question to a child with any ability of abstract thought. This reminds me very much so of another tradition based on fear, that can also be celebrated this time of year amongst another group of people. Now, before getting in to what I do not mean with that, I will get into what I do mean. I doubt many are unfamiliar with the Evangelical traditional view of Heaven and Hell—I myself grew up striving to understand and reconcile it with my thoughts of God and God’s character. As ‘tradition’ (as which I shall here after refer to it as), the view of the afterlife bears a salient resemblance to the aforementioned Christmas traditions (indubitably so with the German Christmas tradition). Firstly so, it’s not merely pertaining to receiving what you want—to which is a genuinely self-centered, selfish view of the world and beyond it, but survival: will I get paradise, Heaven, and outwit punishment, Hell? Secondly, have I been good enough? Have I done everything that I should to obviate Hell and achieve Heaven? Have I said the right thing, done the right thing? Am I part of the Elect? What is considered ‘the right thing’ for me to do anyway? Do I have to pray, believe, be baptized, and ‘sin’ no more? What do you (God) consider good? What will happen if I’m not? I think I’ve been good, but is my frame of reference what’s being used here? What is good anyway? Is Krampus going to come and take me to Hell? To punish me forever for not ‘getting it right’ regardless of the ‘wrongness’ of the presentation? Scare tactics! All scare tactics to elicit appropriate, intended, desired responses. If there’s no controlling Truth itself, there’s no controlling it’s revelation to each and every one of us on Earth. But you better make damn sure that there are those who will strive to control it by controlling how it is presented to the masses. Religion may very well be the opiate of the masses; that does not requisite Truth to be the same. There is no Fear in Love—rather, perfect Love casts out Fear. Regardless of how this season is celebrated—be it Santa of the Birth of Jesus (or neither one of those), it has been traditionally a Season celebrating love. And Love is something—like Truth, that we can’t control. Love is something that is entirely self-less. It’s when we try to control it that we make it fearful. We make laws, we build walls, and we go to war for something to which gives itself freely, utterly independent of us and our actions—naughty or nice.